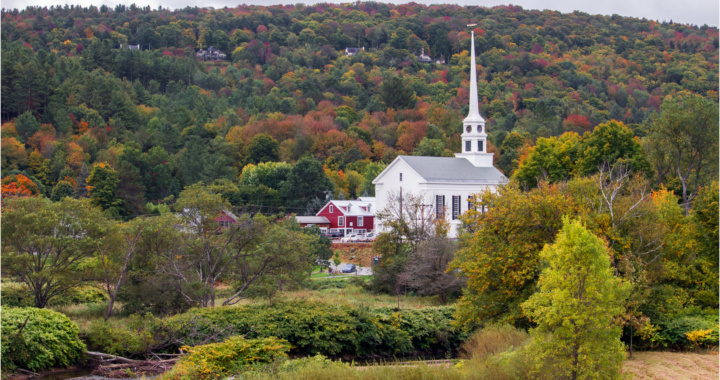 Today we left Jackson and New Hampshire to drive the 125 miles to our next stop – Stowe in Vermont. Taking the Crawford Notch road, we stopped at Breton Woods for a view of the Mt Washington resort hotel. This was the location of the Breton Woods conference in 1944 at which the world’s financial arrangements following World War 2 were discussed. The conference led to the establishment of the IMF and the World Bank. Next we drove on to Waterbury, which is famous as the home of Ben and Jerry’s Ice Cream. Waterbury also has outlet shops for Green Mountain coffee and Lake Champlain chocolates. From Waterbury it was just 10 miles to Stowe and our accommodation at the Stoweflake Mountain Resort. The weather today was slightly overcast, but as it was better than the forecast for the following day, we decided to take the drive to the top of Mt Mansfield, at 4393ft the highest mountain in Vermont. Compared to the Mt Washington road, the toll road up Mt Mansfield is narrower and mostly unpaved for its 4 mile length. As viewed from Stowe, Mt Mansfield has the appearance of a face in profile. The toll road ends at the nose, but the true summit is located at the chin, which is reached by a short hike of about 1.5 miles north along the Long Trail. From the summit, there are extensive views across Vermont and into neighbouring New York State. After returning down the toll road, we took a short walk to Bingham Falls, passing some attractively sculpted rock gorges. The main falls drop 30ft into an attractive pool and are located just south of the colourfully named Smugglers Notch State Park. As expected today was rather overcast. In the morning we drove from Stowe to the Sterling Valley to visit the Sterling Gorge Falls. The Sterling Valley road is mostly unpaved and feels quite remote, though it is only 8 miles north of Stowe. On the way to the falls, we passed the Red Covered Bridge (also known as the Sterling Bridge) built in 1896. The falls are reached by a short woodland walk with some interpretive boards giving information about the history and geology of the area. On returning to Stowe in the afternoon, we walked along the Stowe Recreational Path, a flat path used for walking and cycling which follows the West Branch Little River for 5 miles across fields planted with corn. Finally we returned to Stowe for some pictures in the town.